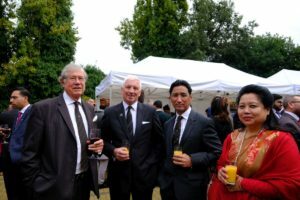 The 20th September 2017 was the National Day of Nepal and members of the Brigade of Gurkhas, Veterans and other honoured guests were invited by his Excellency Ambassador to Nepal Dr. Durga Bahadur Subedi to a celebration function at the Nepal Embassy at Kensington Palace Gardens, London. His Excellency Ambassador, Dr. Durga Bahadur Subedi spoke about the important relationship Nepal and the United Kingdom had and Nepal was going through a stage of development both economically and culturally. He highlighted the number of different faiths in Nepal and how each had a part to play in the future of Nepal. He then turned to Nepali citizens living in the UK which currently number over 4500. Over 2500 are members of the British Army (Gurkhas). He then spoke of praise and admiration for Gurkhas serving in the British Army. 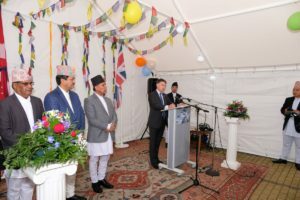 The Ambassador highlighted the success that the Gurkha Everest 2017 team had of succeeding in summiting Mount Everest in May 2017 and he invited members of the team to come forward and accept gifts and praise for the success in becoming the first serving Gurkhas to reach the summit of Everest. Owen Jenkins MP was the honoured guest who gave an equally praise worthy speech about the people of Nepal and the relationship with the UK. Owen Jenkins became the Prime Minister’s Special Representative for Afghanistan and Pakistan in February 2015. 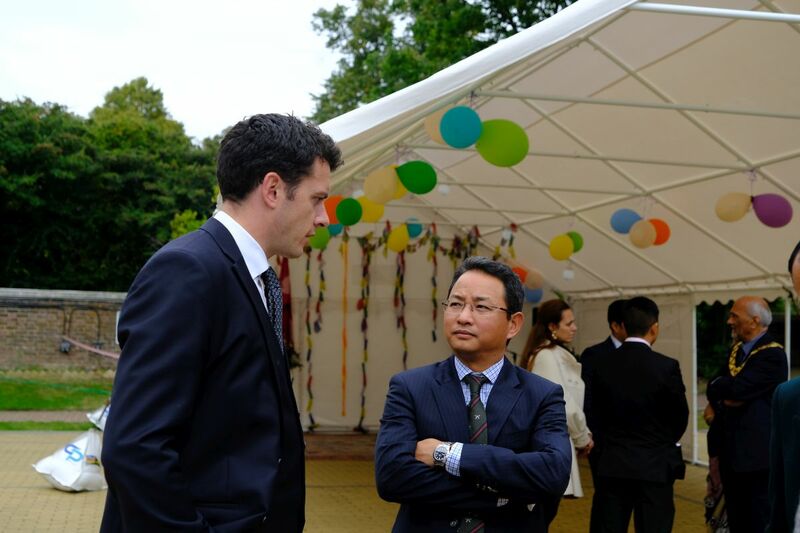 He also remains the FCO Director for South Asia and Afghanistan, a position he took up in October 2014. 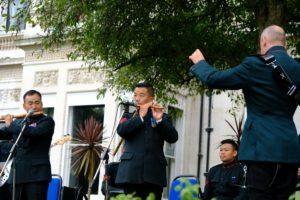 The Band of the Brigade of Gurkhas were present to support the event, with music from their traditional Nepal folk band the ‘Hill Boys’. Nepal established diplomatic relations with the United Kingdom in 1816. A Treaty of Friendship between Great Britain and Nepal was signed in 1923 which further formalised relations between the two countries. Ever since the establishment of their diplomatic relations, friendship, mutual understanding, cordiality, cooperation and respect for each others national interests and aspirations have characterized relationship between the two countries. The United Kingdom is also the first country in the world with which Nepal had established diplomatic relations. The United Kingdom is the first country in the world which established its Embassy in Kathmandu, the capital of Nepal. This is the country where Nepal had established its first diplomatic mission (Legation). Nepal had established its legation in London in 1934, which was the first Nepalese diplomatic mission established at the foreign country. It was elevated to the Ambassador level in 1947 A.D.